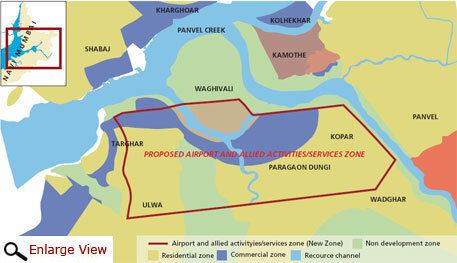 Monsoons brought good news for the controversy-ridden Navi Mumbai international airport project. The multi-crore plan had seen no progress in its execution for over a year due to held up environment clearances and sustained opposition from local residents, who stand to lose their land for the project. However, in last two months some progress was made on these pending issues. While National Board for Wildlife (NBWL) and the Forest Advisory Committee (FAC) cleared phase one of the project in June and July respectively, a major confidence building program was launched by the project’s implementing agency City and Industrial Development Corporation (CIDCO) around the same time to convince land owners that their concerns will be addressed adequately. Conceptualised in 2000, the greenfield airport in Navi Mumbai has been ridden with one controversy or the other since the beginning. The recent developments were considered major breakthroughs in official circles. But the proposal is in limbo due to sustained opposition from local residents. Several complex issues, like mitigation measures for ecological damage and land acquisition and rehabilitation of project affected people (PAP), would have to be addressed before the “iconic” project, being monitored by the Prime Minister’s Office, sees the light of the day. Conditional clearances granted by NBWL and FAC oblige CIDCO to ensure robust mitigation measures for ecological damage during and after the construction of the airport. It appears the clearances have become big money spinners for the state forest department. In its report on the project, NBWL’s site inspection committee has recommended clearance on the startling condition that 3 per cent of Rs.14,573 crore required for the project be kept aside for conservation measures. Before this, while giving its clearance, the state wildlife board had imposed a condition of a yearly grant of Rs.2 crore for the same purpose. These two funds are in addition to Rs.400 crore that CIDCO would have to contribute towards the environment management fund as mandated in MoEF’s environmental clearance. The department would partially benefit from this fund, too. Debi Goenka of the Conservation Action Trust doubts the rationale behind this. “The provision for a fund which draws 3 per cent of airport project’s cost for conservation measures is doubtful. For instance, it is unclear how the problem of bird hits due to presence of Karnala bird sanctuary within 9.5 km of the site can be addressed by allocating more money,” he says. As per the plan, the airport would be spread over 2,072 hectares (ha) in Panvel taluka of Raigad district in Navi Mum bai. CIDCO has acquired 1,572 ha land for the project but the remaining 499 ha are yet to come under its possession. Of the remaining 499 ha, 25 ha land belongs to the government and is likely to be transferred soon. However, acquisition of the remaining 474 ha is the tricky part. This land belongs to 18 villages and settlements in and around the airport site. Over 5,000 people residing in these areas are not yet ready to give up their land for the project due to a deep mistrust of CIDCO. This stems from their bitter experiences during the controversial land acquisition by the agency while developing the city of Navi Mumbai in the 70s and 80s. (see ‘Why the distrust’). The experience of Waghivali is among the worst. The creek island village has been earmarked for the 245 ha mangrove park mandated in the environment clearance. This means 500 residents of the village would have to be displaced. Ironically, they are already embroiled in a legal battle with CIDCO over land rights. Umesh Patil, deputy sarpanch of the village, claims CIDCO officials unilaterally sold the village land to a private firm in Mumbai. “We found out about this only in 2006. Since then we are fighting a legal battle in the Mumbai high court,” says Patil. “We are not against the airport. 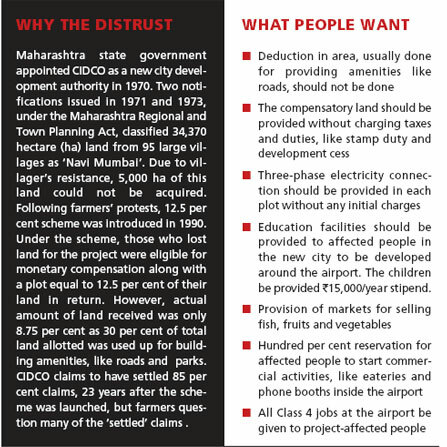 But CIDCO should provide us with adequate compensation and rehabilitation.” Of the remaining 17 villages, 10 would be relocated and seven would have their farms and common land acquired for the airport. CIDCO officials concede the villagers have a reason to be suspicious but assure history will not be repeated. V Radha, deputy managing director, CIDCO, has been recently appointed for getting the project off the ground. The state government is banking on her clean reputation to reassure village residents. Some important provisions of the action plan include transparent villagewise approach for allotment of plots instead of case to case basis, appoi ntment of a chief grievance redressal officer for affected people, reserving five per cent tenements made by CIDCO for them and setting up of a vigilance cell to curb corruption in plot allotments. On August 12, Maharashtra Chief Minister Prithviraj Chavan chaired a high-level meeting to iron out the issues holding the project back. He asked CIDCO to formulate an action plan for resolving affected people’s issues but rejected any monetary compensation for land acquisition. He also asked the planning agency to enter into a dialogue with the people. Except for a clear rejection of the monitory compensation idea, no change in plan was evident. If anything, the meeting appears to have failed in creating an atmosphere conducive for dialogue. The committee representing the 18 villages continues to demand better compensation for land and improved rehabilitation measures (see ‘What people want’). “Our demand is for a monetary compensation in addition to land parcel. The 22.5 per cent offer from CIDCO is inadequate because after subtracting land lost to development, each land holder will get a plot equal to only 15.75 per cent of the land acquired from him,” says Pargaon sarpanch Mahendra Patil, who is a member of the committee. “If we pay the rate they are asking for, the project will become unviable,” says a senior CIDCO official. Looks like it would be long before a consensus is reached and the project takes off.